Not all chairs are meant for sitting. 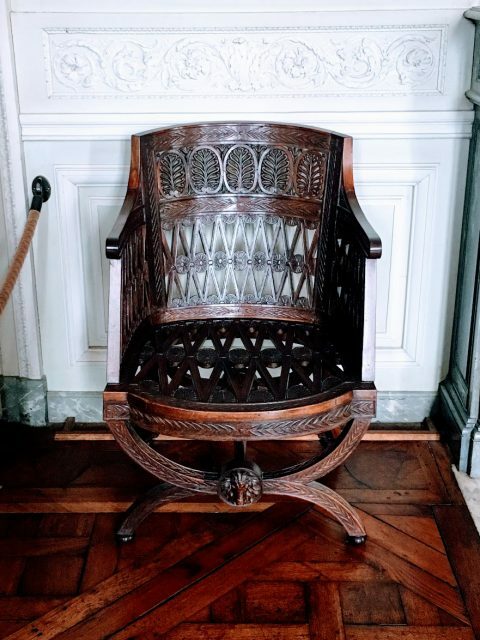 In the Petit Trianon, Marie Antoinette’s private estate within Versailles, the chair is the key to discovering some of the chateau’s deepest secrets. Though this piece of furniture exits in nearly every room of a home, its significance is often overlooked; but each piece has a story to tell—one which is not always as simple as it may first appear. The Petit Trianon was originally built by Louis XV at the request of his mistress, Madame de Pompidou. Because it took several years to construct, it was the king’s next mistress, Madame du Barry, who first inhabited it. 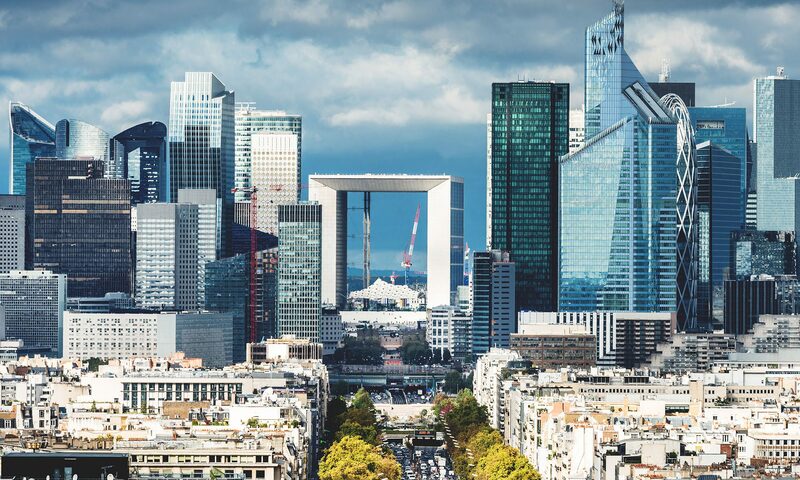 Years later, when Louis XVI was crowned, he gave the outpost to his beloved wife, Marie Antoinette, who took elaborate care in redesigning her new home. Though she only came here for fifteen days at a time, this location was dearer to her than her official place in the main palace. Today, in a museum where a “do not touch” sign is a fixture at the entrance of every doorway, it is difficult for most visitors to discover the guarded mysteries of this historic chateau. Stepping against the red-roped barricade evokes a high-pitched squeak, indicative of an obstacle that has long kept people away from these secrets. But with the help of the chief curator, Bertrand Rondot, these enigmas are beginning to unravel. At the chateau, chairs are a central adornment in almost every room. Nevertheless, only a small number of them were used traditionally as seats. Many of them have intricate carvings on their base meant for spectators to see. What, then, was their purpose? 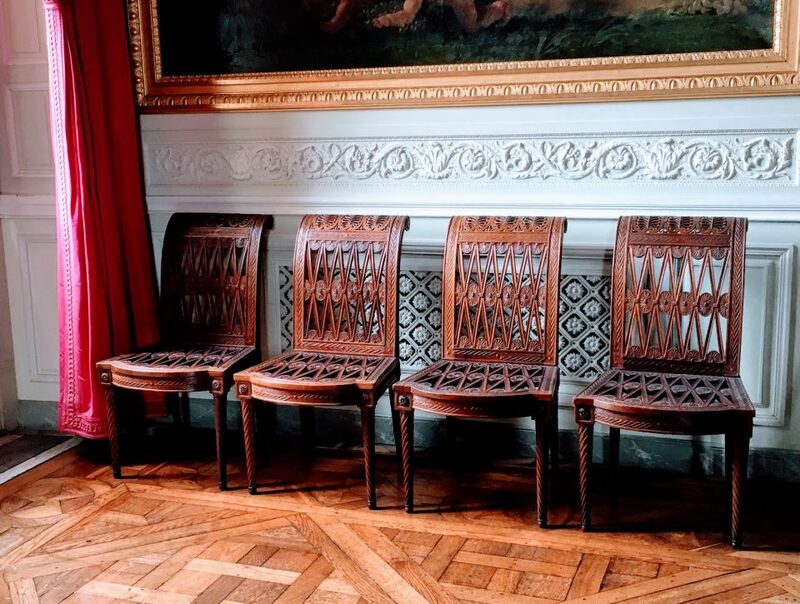 Many of these chairs were carved to simulate a position of status and power. Looking closely, it is possible to see that some of the chairs have an insignia of the monarch. 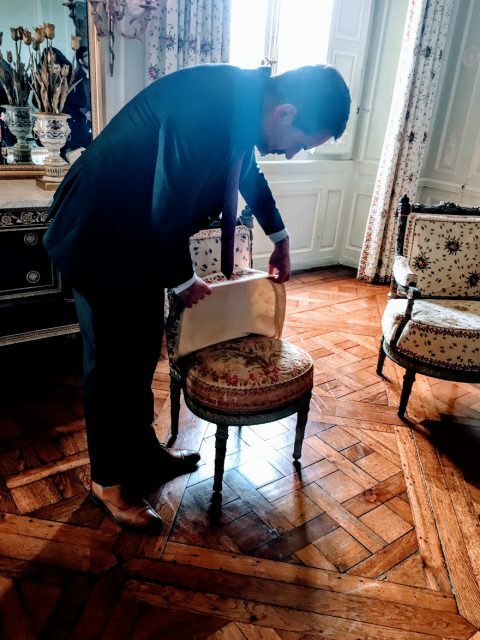 When Marie Antoinette took control of this location, she ordered that these chairs be reworked to bear her own symbol, “M.A.” While furniture is usually registered in files with a specific traceable number, Marie Antoinette destroyed her private “garde-meuble,” or storage locker, where these records were kept to prevent the palace headquarters from finding out how much she spent on this elaborate commission. Of course, some chairs were indeed made for utilitarian purposes. Though much of the furniture on display was brought from other chateaux of the period, some of the pieces are originals. Many of the embroidered cushions are likely to have been sat on by Marie Antoinette and her visitors. But these too carry a secret. Though it is difficult to notice, all the cushioned chairs have covers, ones which only the curator can handle. Pulling back these layers of protection reveals intricate handmade embroidery that is now seldom exposed to protect it from light. During the French revolution, the furnishings within the home were removed or destroyed. When officials chose to restore the home, they found many of these pieces. The chairs were one of the largest moving pieces that helped historians discern the nature of each room. With the help of Mr. Rondot, it is possible to see that the bottom of the chairs is marked with letters and numbers. For example, one displays “C.T. N#78, 20” which means Chateau Trianon, room seventy-eight, one of twenty pieces of this model made. By looking at the clues on these chairs, experts have been able to reconstruct the layout of the home. Each chair has unique relevance, and tells the story of the room it occupies. Chairs change the posture of the actors, and can portray them as weak and insecure, or powerful and confident. By commissioning the chairs that she did, Marie Antoinette was making a point about the tone of each room. 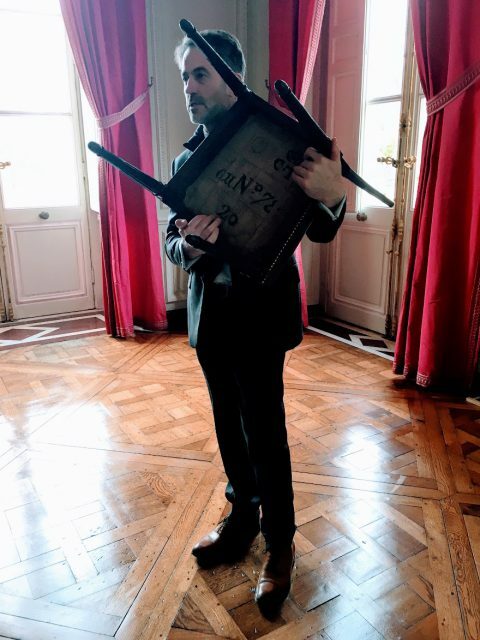 From displaying power, to imbuing the room with a unique atmosphere, the over 50 different types of chairs play a significant role in recreating the grand masterpiece of this private chateau. 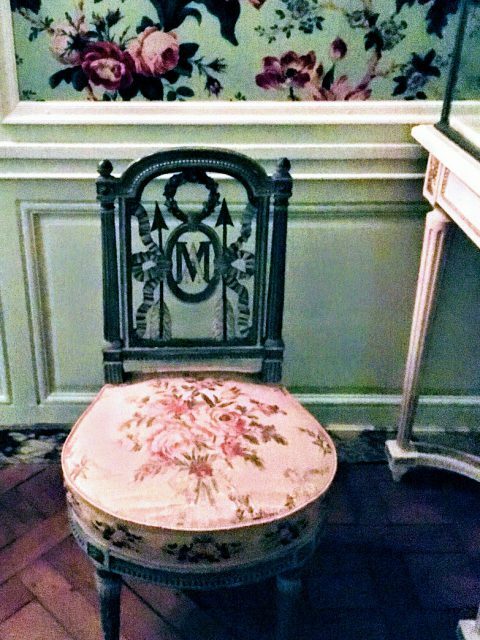 Marie Antoinette’s chairs tell the unspoken tale of her private residence in Versailles. They are written about in few history books, but they play an integral role in understanding the life of a prominent queen, and the settings that she worked meticulously to construct. They are the forgotten secrets that escape the dialogue of a well-remembered palace.